This is the first of a two-part story. O ver one weekend last October, more than a half-foot of rain fell on the small town of Vass in Moore County. By Monday evening, when Hurricane Matthew had moved north and out to sea, a middle section of the spillway at Woodlake Dam had collapsed. Thousands of residents downstream were in danger. The dam and lake are privately owned by Woodlake LLC, a troubled company with a dicey financial and environmental history: spinoff real estate ventures, multiple bankruptcies, broken promises to residents of its upscale development, violations of court orders and an opaque web of German investors and banks. With the dam’s condition continuing to degrade despite court-ordered repairs, this week state officials seized control of Woodlake Dam from its owners after the NC Department of Environmental Quality issued an emergency declaration regarding its safety. DEQ has designated the dam as high hazard. 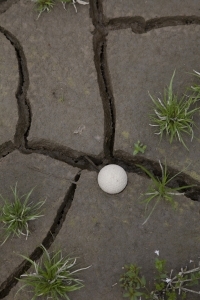 Nearly 1,700 parcels of land lie within the inundation area. DEQ estimates that total private property damage could exceed $260 million if the dam failed during heavy rain. More than 550 buildings, including homes, could be flooded. 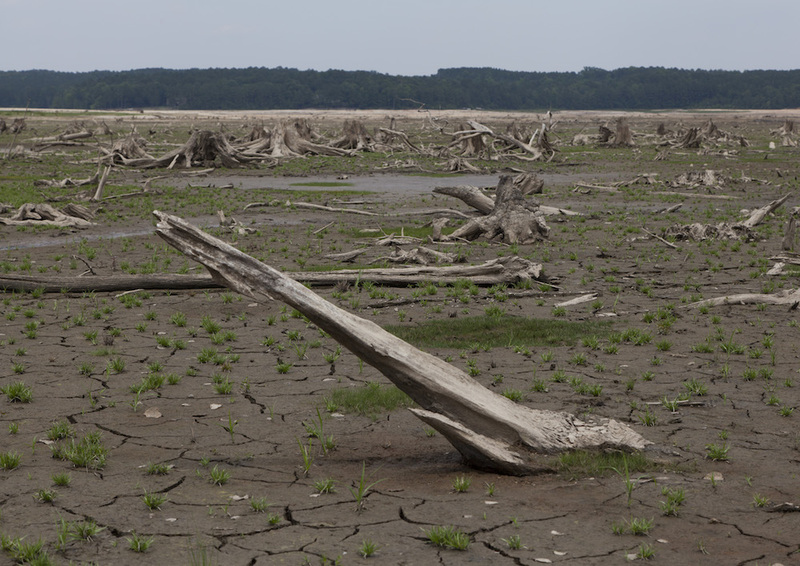 “Its current deficiencies, which if left uncorrected, could result in a failure causing loss of life and significant property damage downstream,” read the June 9 declaration, signed by DEQ Secretary Michael Regan. The emergency declaration surprised neither environmental regulators nor the residents of Woodlake, a golf and country club community. 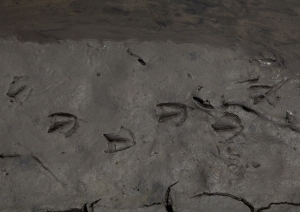 Eight years ago, DEQ records show, parts of the dam’s spillway were so weak that inspectors could break off chunks of the concrete with the heel of their boots. With the lake now drained, DEQ plans to breach the dam, cutting a hole in it until a new structure can be constructed. It could cost the state millions to rebuild the dam from scratch– or DEQ could simply let the lake stay dry and fallow. If DEQ chooses to pay for a rebuild, the attorney general’s office would have to try to recoup the money in court. But the story that unfolds in DEQ and bankruptcy documents does not inspire confidence that the state will be repaid. “Time will tell how this is going to play out,” said David Watterson, a Woodlake resident and a leader of the Restore Woodlake Committee. The citizens’ group wants to save the dam and in turn, the lake, even if it means buying it — and the liability — themselves. Otherwise, “it’s going to have a profound effect on property values,” he added. Julie Watson, vice president of Woodlake CC, did not return calls from NCPW seeking comment; an email sent to her personal account bounced back. On that Monday night in October, Lake Surf lapped within six inches of the top of the spillway. A resident in the Woodlake development notified state environmental officials. They determined the dam would imminently fail, opened emergency spillways, pumped water from the reservoir, closed the middle gates and called the National Guard to hold them shut with sandbags. People were evacuated from their homes. By mid-week, water levels had dropped enough that inspectors decided the dam, would likely hold and continue to protect the residents and businesses downstream. The close call was the result of Woodlake CC’s neglect — neglect that the citizens of North Carolina will likely pay for. 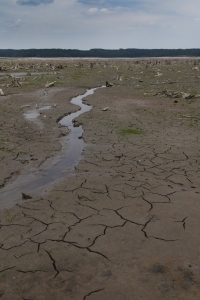 O nce filled with billions of gallons of water, Lake Surf is now a cracked mosaic of mud. Stumps jut from the damp bed. Raccoons ducks, and even the occasional golf ball have left their marks near puddles and small streams. The water table is so close to the surface that walking on the bed feels like walking on a soaked sponge. The lake’s 23-foot earthen dam can hold 10,000 acre-feet of water, equivalent to about 3.26 billion gallons. 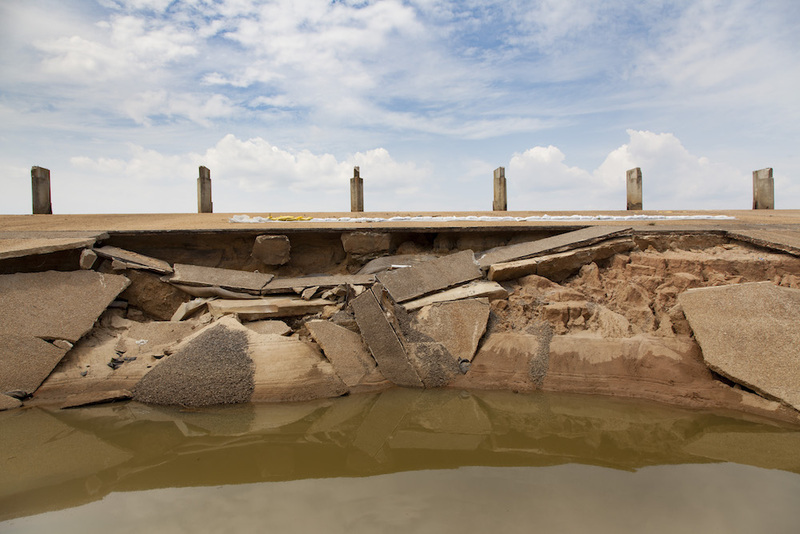 But the structure is so degraded, DEQ documents show, that even just 4.75 inches of rain over six hours could further damage the concrete spillway and breach it. Heavier amounts, 10.5 inches, over the same time could run over the top of the dam and potentially destroy the spillway, with catastrophic results, including deaths of residents living downstream. A closer look at the dam shows the astonishing degree of its deterioration. Concrete slabs lie akimbo, like a mouth of crooked teeth. Sandbags have been placed along the joints to keep the water out. Weeds are growing through gaps in the spillway. The dam’s deficiencies date back to at least 1996. German businessman and attorney Ingolf Böx (pronounced Bahk) had purchased the lake, dam, resort and housing community 16 years prior. He operated a company called Woodlake Properties, with Julie Watson as co-manager. Based on dam inspections between 1997 and 1999, DEQ’s Division of Energy, Mineral and Land Resources (DEMLR) issued several notices of deficiency to Woodlake Properties: deteriorating joints in the spillways, erosion on the front slope of the dam, and other maintenance issues. It took three years, but those repairs were finally completed. DEQ found no deficiencies from 2000 to 2008. But by 2009, Woodlake Properties had encountered tax problems and been dissolved. The dam was then owned by Woodlake Parters, LLC — a different company name but with the same players, Böx and Watson. The concrete spillway again was cracking, failing to drain properly and its walls were shifting in the soil, according to DEQ documents. The spillway was in an “advanced deteriorated condition,” with weeds and small trees sprouting from joints near the bottom of the chute. From 2009 to 2014, DEMLR issued at least two more notices of deficiency and sent letters to Watson detailing the many outstanding issues. According to DEQ documents, Watson often ignored those correspondences. Böx spent most of his time in Germany. 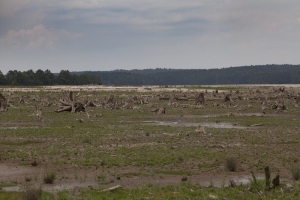 Woodlake Partners declared Chapter 11 bankruptcy (and later Chapter 7) in 2014, but nonetheless submitted repair plans for the dam, with permission from the court. However, the company never followed through on the actual work. Böx, who, court records show, was personally broke, no longer had a financial stake in Woodlake. Yet another German investor, Illyah Steiner of Steiner and Co., bought the resort, including the country club, two golf courses, lake and dam for $500,000 at a 2015 auction. Steiner was the sole bidder. Then last October, the dam sustained further damage during Hurricane Matthew. A month after the historic storm, DEQ issued a dam safety order requiring the new company, Woodlake CC — yet another company name with Watson in charge — to repair the structure. The company made overtures that it would complete the work, but eventually began ignoring DEQ’s questions. Finally in March of this year, DEQ took Woodlake CC to court. At that hearing in Moore County, Watson promised the judge the dam would fixed to DEQ’s specifications by June 28. But the company’s finances are about as solvent as its dam. DEQ documents show that Woodlake CC failed to pay its engineering consultants Geosyntec $270,000, prompting the firm to cancel its contract to fix the dam. “It appears that Woodlake is insolvent as to its ability to fund the work required by the Dam Safety Order,” Geosyntec wrote to DEQ. Other debts piled up, including $40,000 to another engineering firm, plus county taxes and outstanding invoices to other vendors. Steiner and Co. put up $6 million in Woodlake property as collateral to try to secure a loan for the repairs. But even with all the wheeling and dealing, DEQ realized that Woodlake wasn’t solvent enough to pay for the repairs. So on June 9, the state took over. DEQ has contracted with Thalle Construction of Hillsborough for the dam breach, to begin next week. The cost, according to DEQ documents, is $996,000. For eight years, the owners of the Woodlake Resort and Country Club have failed to repair major structural failures at the Woodlake Dam. 1968 AB Hardee develops Woodlake, including a country club, golf course and home plots on and near Lake Surf. 1980 Family of German investor Ingolf Boex (pronounced Bahk) buys Woodlake Resort and Country Club, including the dam. 1996 Division of Energy, Mineral and Land Resources (DEMLR) issues first notice of deficiency on the dam. 1997-1999 DEMLR conducts several inspections and notified Boex of several deficiencies, including deteriorated spillway joints and a damaged front slope of the dam because of erosion. Repair work is done by 1999. February 2009 DEMLR issues notification of deficiency to Woodlake Partners because the spillway is cracked, drains aren’t properly operating and other maintenance issues. January 2010 Woodlake Partners submits repair plan, but notes additional problems with the dam. January 2011 Woodlake Partners submits revised design plans; two months later, DEMLR responds with additional requests. February 2012 DEMLR inspects the dam, which is still in disrepair. March 2013 DEMLR issues two more notices of deficiency, based on the same problems from 2009, plus additional decay of the dam. April DEMLR issues two more notices of deficiency, based on the same problems from 2009, plus additional decay of the dam. August Woodlake sends repair plan addressing some, but not all of the deficiencies. Estimated repairs would occur in 2016. September Woodlake Partners files for Chapter 11 bankruptcy. December Woodlake Partners submits new plan, with repairs to be completed by May 1, 2017. May DEMLR approves Phase I but no work begins. July DEMLR issues order to Woodlake CC, the new owners, to begin work on the dam within 91 days. Oct 8-10 The dam is still not repaired when Hurricane Matthew hits; water level in the lake reaches within 6 inches of the top of the dam. DEMLR activates emergency spillways and installs pumps to draw down lake levels. Oct 28 Geosyntec, hired by Woodlake CC, submits interim design plans to repair damage from hurricane; they are quickly approved. Nov 17 DEMLR again orders the repairs to begin because of problems that “threaten” the dam’s “structural integrity.” Water levels at the dam must be no more than 211 feet, and DEMLR lays out other deadlines for design and repair. Dec 20 Geosyntec notifies Woodlake CC that it is ending its contract because of nonpayment of $270,000. Woodlake does not respond. Nov 17 DEQ issues a dam safety order, requiring the temporary breach of the dam by Dec. 31. Water level in the dam must remain below 211 feet. 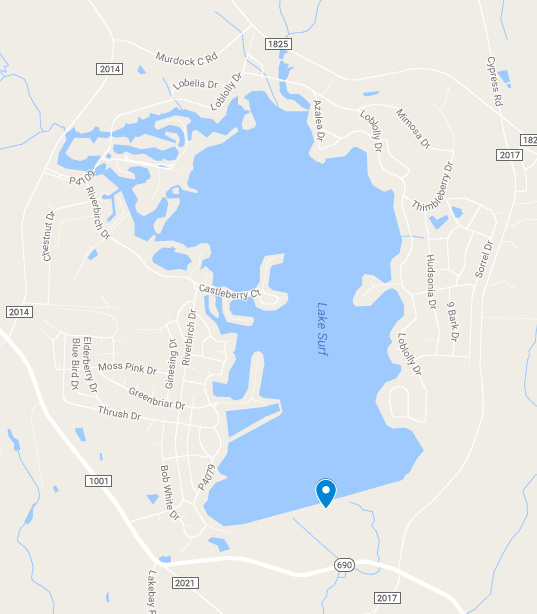 Jan 27 A Moore County judge finds in favor of DEQ’s legal complaint against Woodlake CC. The company must drain the lake, install erosion controls, provide weekly status updates and begin construction on emergency temporary breach of the dam by March 29. Water still ponds in some spots in the lake bed, attracting ducks. 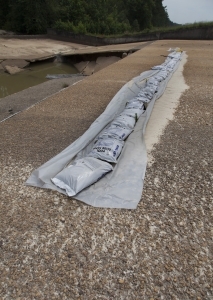 Sandbags have been placed on weak joints in the dam. 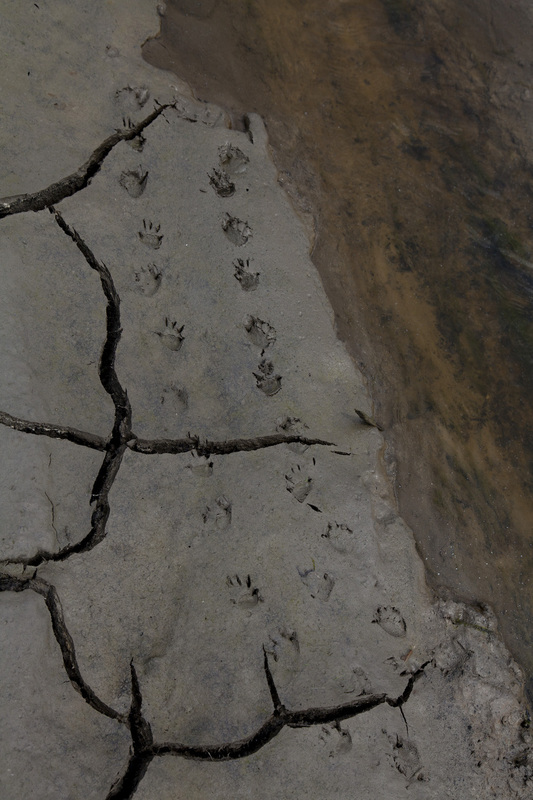 Although the lake bed reveals another natural world, there are also relics of human activity — golf.